No one expects a one-day business conference to resolve any economic ills, but it can, perhaps, help put things in context. After months - years - of relentlessly bad news, delegates arrived at Monday's annual gathering of the CBI employers' group looking for messages of hope. I'm after "something to hang onto", said the manager of a printing company. Chatting over coffee at the start of the day, he said his business was "ticking over". At the start of the year there were "definite signs of things picking up, but I'm preparing for a much tougher 2012". He chose not to disclose his name or company. "I don't need the hassle of my customers knowing times are tough, nor my bank manager". He was here for two reasons. First, because he was looking for export opportunities (a key theme of the event); second, he wanted "some face-to-face time" with business people from other sectors. 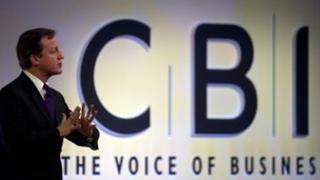 He had attended CBI conferences before, but not for several years. "I'm far too busy to be a regular at events like these. Despite what people think, running a small business is not an endless round of meetings and glad-handing. You can feel very isolated, sometimes," he said. And that is probably the single most important reason people come to these events. It acts as a comfort blanket, especially in these economic times. Because, although it's the good and the great who are on the conference podium, the audience is pretty much made up of owners and executives running small and medium-sized businesses. But even if you are among the business elite, the reasons for attending are not dissimilar. Sir John Egan, whose CV includes spells at the top of Jaguar Cars, airports operator BAA, and utilities group Severn Trent, is here to "understand the realities". "There seems to be so much bad news at the moment, but is that the reality?" he told the BBC. "People who have been around as long as me have seen several recessions, and at CBI conferences you can take soundings to see if everything is as it seems." Well, the bad news is, yes, things are grim. The good news is, Sir John sees no reason why UK PLC cannot emerge strong and healthy from this downturn. "When you're dealing with the economy, things are never as bad as they seem, just as, perhaps, the boom years are never as good as they seem," he said. "There are plenty of people just getting on and doing business. We've always come through bad times, and will do so again." With stock markets plunging and sovereign states staring into the abyss, such comments can sound more like hope than reality. But time and again during the conference the message was similar. Steve Goodman, founding partner of consultants Business Breakthrough Coaching, can see light at the end of the tunnel. It's just that he is not sure "how long the tunnel is". Mr Goodman advises companies on their behaviour, attitudes and values. When a manager or business seems to have hit a metaphorical brick wall, the trick is "not necessarily to try harder, but to try things differently", he says. Which, in a sense, paraphrases the theme of the CBI conference, that UK-focussed companies look outside their traditional markets to emerging economies. That is, do something different. The UK consumer may be in retreat, and the eurozone may be going bust, but there are boom economies outside Europe with an insatiable thirst for goods and services. As pointed out in a speech by Jim O'Neill, chairman of Goldman Sachs Asset Management, the BRIC economies of Brazil, Russia, India and China, are growing by the size of Italy each year. Such messages have hit home among the business people of the future. Haroon Khan, a young MBA student at London Business School, says there is "unquestionably a perspective beyond the doom and gloom. It is a question of psychology", he said. It could be the confidence of youth, but Mr Khan sees nothing but a world of opportunity. "Of course times are tough in some countries. But when you look around the globe, the sky is not falling in," he said. "There are loads of opportunities. "It's a question of whether you can exploit them." Which brings us back to the manager of the printing company, who at the start of the day spoke with trepidation about the future. After a few speeches, and a bit of networking, he said: "You lot (the media) pump out so much bad stuff. Have a look around, it's not all bad news." OK, he acknowledged that the optimism might wear off. But at least he knows he's not struggling alone during the worst downturn in decades - and maybe, perhaps, things are not as grim as he felt. "And I'm learning a few things," he said. "Today will probably end up being a worthwhile use of my time."